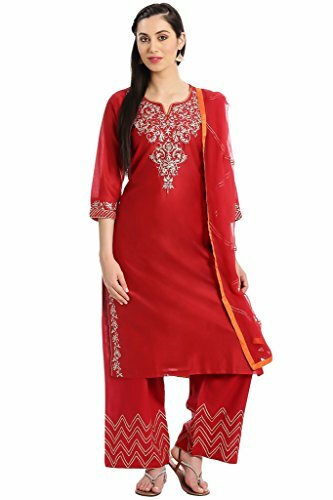 Exhibit your grace by wearing this red embroidered suit set to any occasion round the corner and gain oodles of compliment. The kurta with golden piping on the neckline looks alluring and the embroidered yoke looks amazing. The straight printed bottoms look well-matched and also complement the dupatta with grace. Wear it with high heels and golden earrings for maximum charm.